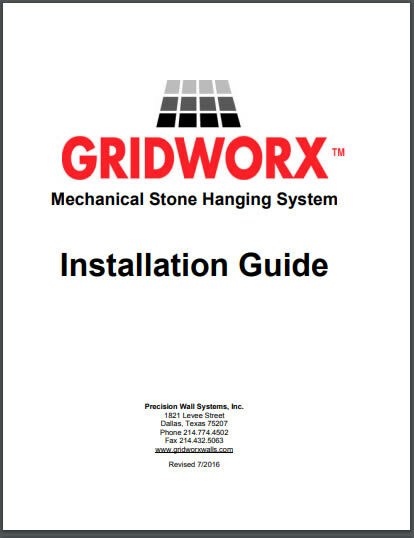 Gridworx is a revolutionary mechanical stone hanging system that combines patent-pending wall anchors to support kerf-cut thin stone. The end result produces the natural beauty of stone at a fraction of the cost of full bed masonry stone walls. The system is pre-engineered for use with wood frame, steel stud, CMU block or concrete walls. Gridworx vastly simplifies the installation process. GRIDWORX provides this personal & secure page to better serve you. If you are interested in becoming a preferred installer, we need you enter the following information so that we discuss project specific details with you. If you are currently working with us great, but we still need your login. For general installation questions, you can contact us here. We ask that you register your name, firm name, a contact number, and email address on the form to follow, so that we may provide you with LOGIN credentials for your personal portal page where you can communicate directly with our drafting staff, upload your files and register any projects we are working on. Additionally, we ask that you describe your role in the construction process.